Πατήστε τη φωτογραφία και δείτε όλες τις φωτογραφίες του Airport Hotel Olive & Blue. 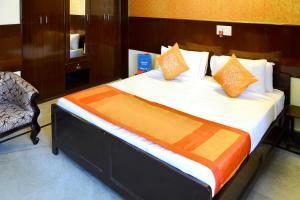 Airport Hotel Olive & Blue offers accommodation in Mahipalpur, New Delhi. Guests can enjoy the on-site restaurant. Free WiFi is featured and free private parking is available on site. The rooms come with a flat-screen TV with satellite channels. Certain units include a seating area where you can relax. Rooms include a private bathroom equipped with a shower. Indira Gandhi Airport is 3 km from the property while Gurgaon is 6 km away. New Delhi Railway Station(NDLS) and New Delhi is 10 Km from Airport Hotel Olive & Blue. Please note that the property provides airport pick up and drop facility at an additional cost of INR 500 and INR 300 respectively.